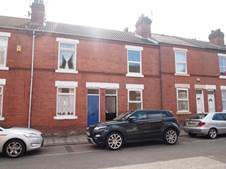 Two bedroom mid terraced house, GCH – part D.G. Enclosed rear garden area to the rear and on street parking, the property is close to the train station and within easy walking distance of Doncaster town centre. Comp: Entrance hallway, lounge, dining room/second sitting room, modern kitchen units, door to the rear garden area and door to the cellar, stairs to the first floor, two double bedrooms, spacious bathroom/WC with over bath electric shower. Bond £500 – professional tenants only.